If the French authorities hoped that after the horrible weekend of November 17-18, the protest of the "yellow vests" would come to naught, they were cruelly mistaken. The date of the next promotion was scheduled immediately on Monday. Exactly in a week, on November 24, members of the “anger and suffering” movement will gather in Paris. The call, thrown by one of the spontaneous leaders of the "vests" Eric Druet, found full support on the web. Only in the first hour after the appearance of the new information, more than 20,000 people said they were ready to take part in the second act of this drama. Of course, in the end they will be much more. Rose all of France, the citizens as they are. On Saturday, road blocking campaigns were held in almost all departments of the country. According to French Interior Minister Christophe Castaner, 287 thousand people took part in them, the movement was blocked by more than 2000 posts. But this is only official data. The protesters themselves consider the figures to be understated by at least a third. In Paris, Cholet, Rennes, Nimes and in the Amiens area, clashes with the police occurred. Law enforcement officers used special equipment and tear gas. In total, about 528 people were injured, of which 17 were seriously injured, one woman died. Thousands of activists were detained, 73 people were arrested. One person has already been sentenced to a four-month prison sentence, and this is only the beginning. The police have losses too: dozens of policemen suffered various injuries. It was expected that with the start of the working week the protesters would calm down. However, this did not happen. On November 19, around 37,000 people still took part in the ceiling. By Tuesday morning, several main roads remained blocked: A7, A8, A9, A10, A20, A28, A61, A62, and A71. In many places, local bikers joined the “yellow vests”. The guys on motorcycles are usually not too concerned about the daily routine. 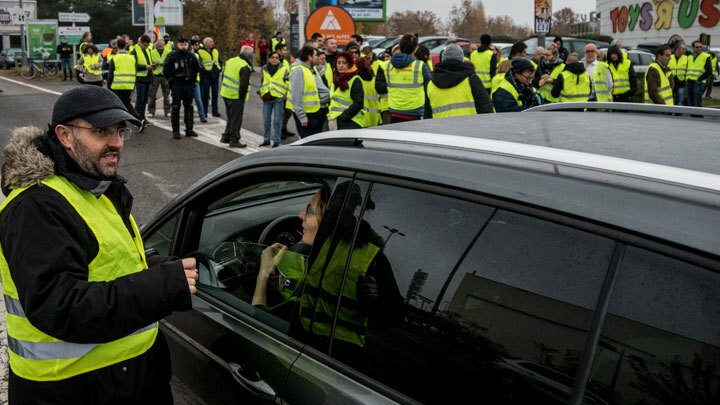 The movement of “yellow vests” (so named for reflective vests, mandatory on French roads) arose quite spontaneously - in the wake of a protest against rising gasoline prices and government plans to introduce an additional tax on hydrocarbons. Only in the last year, the diesel popular in France has risen by 24%, now its value is 1.6 euros. The price of gasoline, similar to our 95th, rose by 10-15%, on motorways it costs about one and a half euros. But the government thought it was not enough. From January 2019, it plans to raise the tax on diesel fuel by 6.5%, and for gasoline - by 2.9%. As prices will rise at the same time, we can only guess. The growth of tariffs at gas stations is very painful for the purchasing power of the population and the standard of living in the country as a whole, especially in the provinces, where people often work 40-50 km from home. Patience came to an end. Or is there a pause? If you look at the French social networks, it becomes clear that it is not just a matter of economic requirements. The moods of people can be expressed in one short word - “enough”. It was enough for them that the authorities cover their relations with corporations and banks with good intentions and simply work out the money received for the election campaign. It was enough for them that the taxes were too high to feed the migrants, and the average Frenchman had to work hard to make ends meet. They are fed up with the fact that migrants are paid for the number of children, and for a French working family, it is better not to give birth at all because it is hard to earn for a decent living. On Monday, November 19, French Prime Minister Edouard Charles Philippe on TV, that you heard the "anger and suffering" of the protesters, but did not change their course. President Macron in his turn simply demonstrated utter surprise. He mentioned that people oppose what they themselves recently voted for. In such a derogation of Macron, perhaps, the main deception of modern Western democracy is hidden. The scheme here is simple. During the election campaign, Macron declared the protection of the environment, and people voted for it, a good thing. But the statement itself was not completely disinterested. The same Rothschild & Cie Banque, in which the president has long worked as a top manager, and who greatly supported him during the election campaign, is actively involved in translating the French automotive industry into electric cars. One of the tasks of power in these circumstances is to replace diesel and gasoline cars with electric cars in the coming decades. About the harm that the discarded batteries are capable of causing to the ecology, while they have forgotten: when they get rid of gasoline, it will be necessary to announce some kind of new environmental campaign. Anyway, tax measures should provoke the French to make the "right choice", and their wallet. From this course, the government can not turn, it has already been paid for a long time and irrevocably. But this is only the very tip of the iceberg. Already on Monday, the activists of the "yellow vests" began to talk about the need for self-organization, the transformation of spontaneous protest into a civil political movement. The creation of such a movement that arose on the street and united by it, can most significantly change the political situation in France. It is very likely that it will mark the end of the entire left-liberal agenda, symbolized by Macron and his government. Of all the structured political forces, the most distinctly “vests” were supported by the rightists — the National Front with Marine Le Pen — and the left, by the "Unconquered France" movement with Jean-Luc Melenchon. Gradually this choice - “Everything except the middle!” - becomes essential for the “old” Europe. And the "yellow vests" clearly show that they have a great future.